Over the weekend, various ill-informed leftists marched around the world in support, ostensibly, of the Earth’s climate. As usual, ignorance was plentiful while knowledge of anything relevant to climate science was invisible. If you want to learn something about climate science, as opposed to political propaganda, go here to read an important, just-released paper by Dr. James P. Wallace III, Dr. John R. Christy and Dr. Joseph S. D’Aleo, which has been endorsed by a number of other prominent climate scientists. The paper is titled “On the Existence of a ‘Tropical Hot Spot’ & The Validity of EPA’s CO2 Endangerment Finding.” As you likely know, the EPA’s outrageous finding that emissions of carbon dioxide, which is necessary for essentially all life on earth, endanger public health or welfare was the basis for the Obama administration’s war on affordable energy. Like any legitimate scientific paper, it is hard to summarize. I will try, but you really should read the whole thing. Adjusting for just the Natural Factor impacts, NOT ONE of the Nine (9) Tropical temperature time series analyzed above was consistent with the EPA’s [Tropical Hot Spot] Hypothesis. 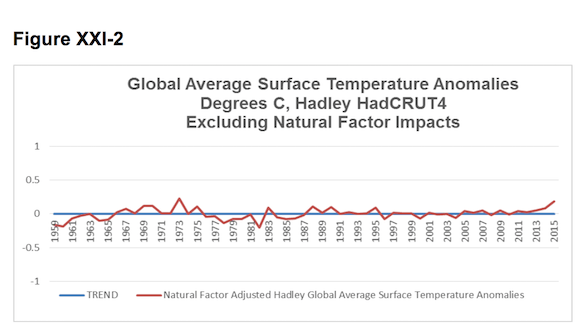 That is, adjusting for just the Natural Factor Impacts over their entire history; all nine of tropical temperature data analyzed above have non-statistically significant trend slopes—which invalidates the THS theory. Moreover, CO2 did not even come close to having a statistically significant impact on a single one of these temperature data sets. From an econometric structural analysis standpoint, the generic model worked extremely well in all 9 cases. These analysis results would appear to leave very, very little doubt but that EPA’s claim of a Tropical Hot Spot, caused by rising atmospheric CO2 levels, simply does not exist in the real world. Also critically important, this analysis failed to find that the steadily rising Atmospheric CO2 Concentrations have had a statistically significant impact on any of the 14 temperature time series that were analyzed. Thus, the analysis results invalidate each of the Three Lines of Evidence in its CO2 Endangerment Finding. Once EPA’s THS assumption is invalidated, it is obvious why the climate models they claim can be relied upon, are also invalid. It is remarkable that anyone would argue for the superiority of a half-baked theory, as described in a model, over empirical observation. Certainly no competent scientist would do so. Yet that is what is happening in the global warming debate. As we have documented many times, leftists, knowing they are losing the argument, have resorted to altering surface temperature records, over which they have jurisdiction, to conform to their theory. This is, in my opinion, the worst scandal in the history of science. The above analysis of Global Balloon & Satellite atmospheric temperature as well as Contiguous U.S. and Hadley Global Average Surface Temperature data turned up no statistical support for suggesting that CO2, even taken together with all other omitted variables, is the cause of the positive trend in the reported U.S. and Global temperature data. In fact, it seems very clear that the Global Warming that has occurred over the period 1959 to date can be quite easily explained by Natural Factor impacts alone. Given the number of independent entities and differing instrumentation used in gathering the temperature data analyzed herein, it seems highly unlikely that these findings are in error. One final question remains that has not yet been explicitly dealt with herein. It is, can the existence of the CO2 equation really be confirmed so that simultaneous equation parameter estimation techniques must be utilized to confirm CO2’s statistically significant impact on temperature? In the Preface, the authors referred to a specific paper for a proof. Below very significant additional proof is provided. With CO2 determined to be not statistically significant in the structural analysis of the 13 temperature data sets as summarized in Section XXIII immediately above, the equation system described in the Preface can be seen to be recursive which permits parameter estimation of the CO2 equation in the system by ordinary or direct least squares. (∆C – cfossil)t, is the efflux of Net non-fossil fuel CO2 emissions from the oceans and land into the atmosphere and cfossil is CO2 emissions from Fossil Fuel consumption. Tt is UAH Tropical TLT Ocean temperature. The expected sign is positive. CO2,t-1 on the right-hand side is a proxy for Land use. The expected sign is negative, because as CO2 levels rise, other things equal, the CO2 absorption of the flora increase. As shown in Table XXIV-1, applying ordinary least squares to this equation yields a high Adjusted R square (0.64.) The coefficients have the correct signs and are statistically significant at the 95% confidence level. * The earth’s climate has been changing for millions of years. We are currently living in a geologic era characterized by ice ages. I like to point out that 15,000 years ago–the blink of an eye–the place where I live was buried under ice somewhere between a half mile and a mile thick. Scientists have theories, but nothing approaching knowledge about why wild swings in the earth’s climate have occurred over the last million years. One thing we know for sure is that it had nothing to do with mankind’s emission of carbon dioxide. * We are living in a relatively cool era. Since the end of the last Ice Age, the earth has been warmer than it is now most of the time–most experts say, about 90% of the time. So if temperatures rise a little, it is hardly a surprise. * A reasonable (although debatable) scientific argument based on energy transfer can be made that a doubling of CO2 would raise the earth’s average temperature by 1 degree centigrade. Everyone agrees this would be a good thing. * To generate scary headlines, alarmists speculate that various positive feedbacks would increase that possible 1 degree temperature gain to somewhere between 3 and 6 degrees. These feedback theories are speculative at best. Really, we know they are false, since higher temperatures over the past 500,000 years have not caused any sort of runaway temperature increase. * Global warming alarmism is based solely on models, not on observation. But we know the models are wrong. They predict far greater warming than has been observed over recent decades. A model that has been proved wrong is worthless. It can’t be resuscitated by after-the-fact selective, politically-motivated tweaking. That, really, is all you need to know.